This game teaches you how to kick using angles and spins. These rules are for the one player version. The two player game could be played with each person playing a set, or taking turns shot after shot. Each shot uses the same CB. Place the CB (can be a solid) on the head spot, a stripe on the foot spot. 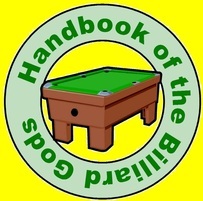 The player must call and hit a minimum of one rail before a contact with the other ball. Multi-rail accidents are not counted. You must call the number of rails. If a ball is pocketed, spot it and continue. No penalty. Ten shots equal one frame. Ten frames equal to one game. Points from all 10 frames are added for the final score. One point is scored when the shooter's designated CB hits the required minimum number of rails and then contacts the object ball.